Hello! Happy Monday everyone! It's Dare to Get Dirty week over at Splitcoast, and there are lots of fun challenges for Fan Club members. I'm playing along with my TE Baker's Dozen teammate Tammie's Dare to Get Dirty challenge (details can be found here). 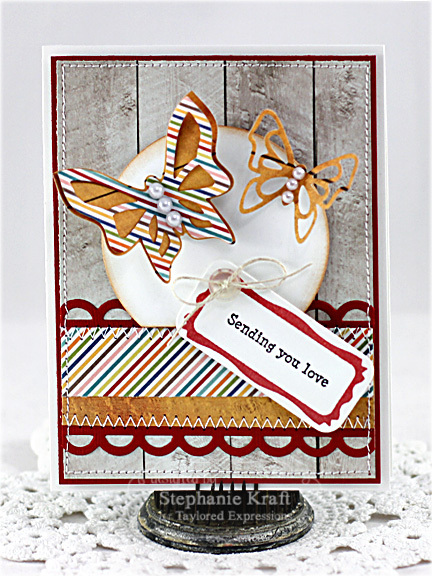 I used the Taylored Expression, A Little Love, stamp set to create the little sentiment tag and several TE dies (Favor Frame, Flutter-bys and the Open Scallop Border). Accessories: Taylored Dies: Favor Frame, Flutter-bys, Open Scallop Border (TE); Standard Circle Nestabilities - LG (Spellbinders), Pearls (Queen & Co), Hemp cord, Foam tape, Thread, Sewing machine. Such a pretty card Stephanie! I love the beautiful butterflies!